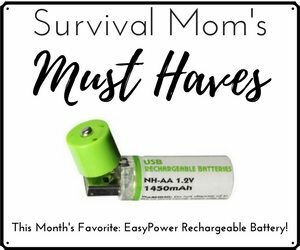 Until I seriously became a prepper, the most likely disasters in my life involved my nail tech quitting or my husband insisting on a homemade dinner! How times have changed. Now when I think of disasters, I’m thinking more along the lines of The End of Days scenarios with an unsettling feeling they could happen now, in my lifetime. 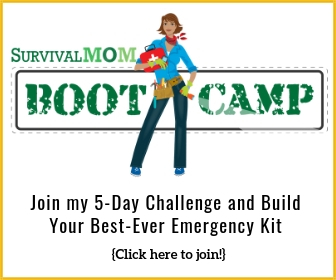 For which disaster, or disasters, should I prepare? These days of hard, uncertain times it’s a little like playing the odds. Hmmmmm, should I prepare for a nuclear attack? If so, I’ll need an enormous amount of sheet plastic, duct tape, and I read somewhere that you’re better protected from fall-out if you have a few feet of earth piled up against your outside walls. Our HOA would just love that! But, really, is my very first concern a nuclear attack? No. The odds are much better for a dramatic increase in crime and riots in certain parts of our city or peaceful protests that suddenly become very violent. Even better odds favor a continued deep decline in our incomes, higher taxes, and possibly losing our home to foreclosure. 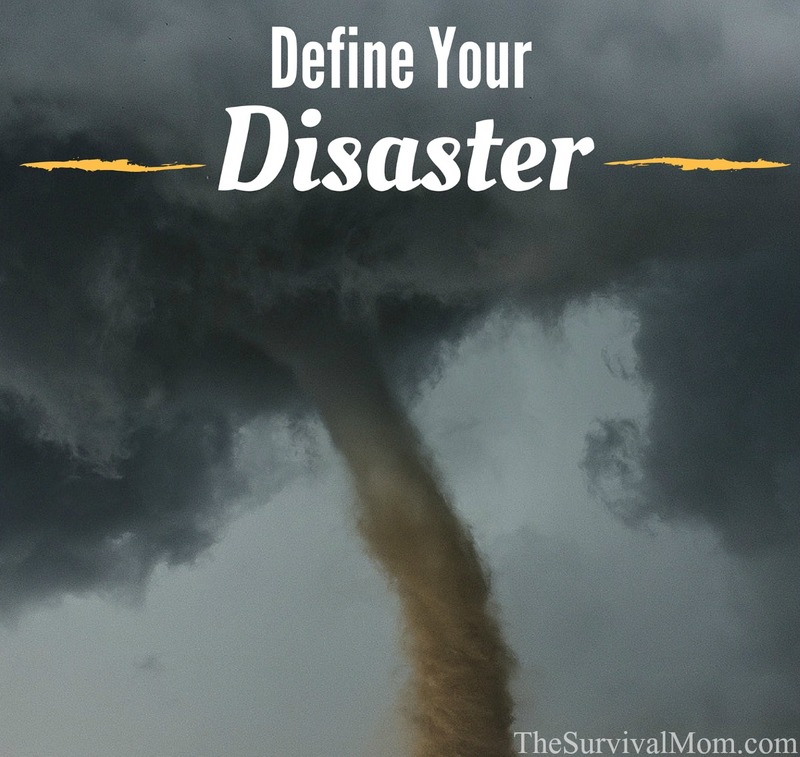 It just makes sense to, first, define the most likely disasters, and then prepare for each as best you can. 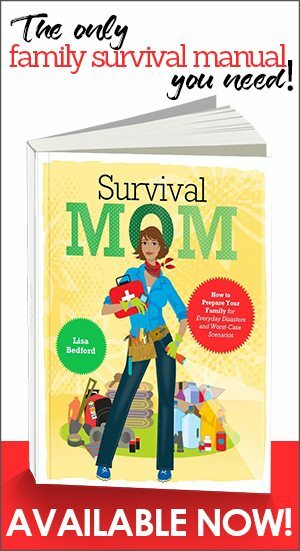 A comprehensive survival guide like this one makes this easy. Since the catastrophic event most likely to affect us is loss of income, that’s where my focus has been. Some time ago, I turned our spare room into a pantry, and my goal has been to store at least six month’s worth of food. This translates into a 6 month margin in which I wouldn’t have to spend money on groceries. I’ve also fought hard to save every penny I can. Terrorist attacks — use your imagination. Terrorists certainly do! With some planning and prepping, you realize you have more control over how these events will affect your family than you might think. The key is to identify likely calamities and then take action. Fortunately, prepping for one event gives you a head start prepping for additional events, thus saving money and time. What is Number One on your list? 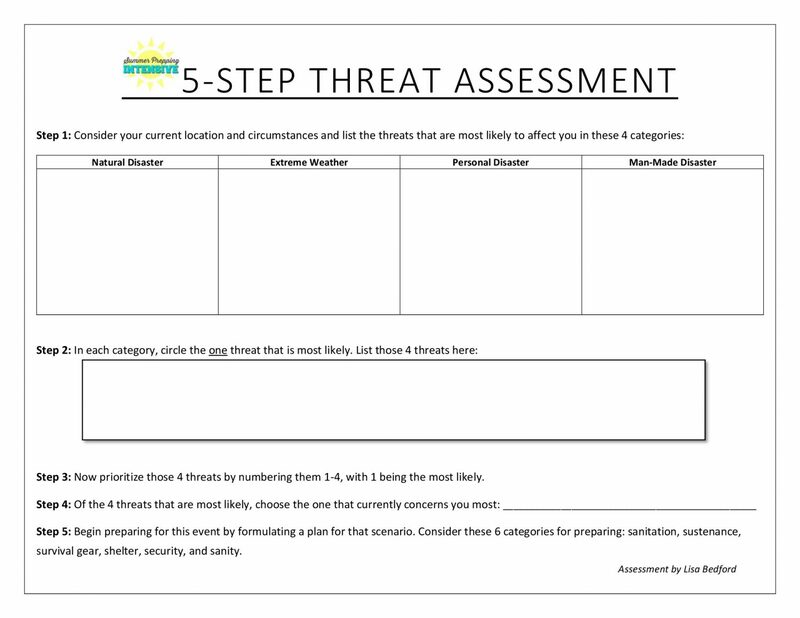 Click here to download and print this assessment. 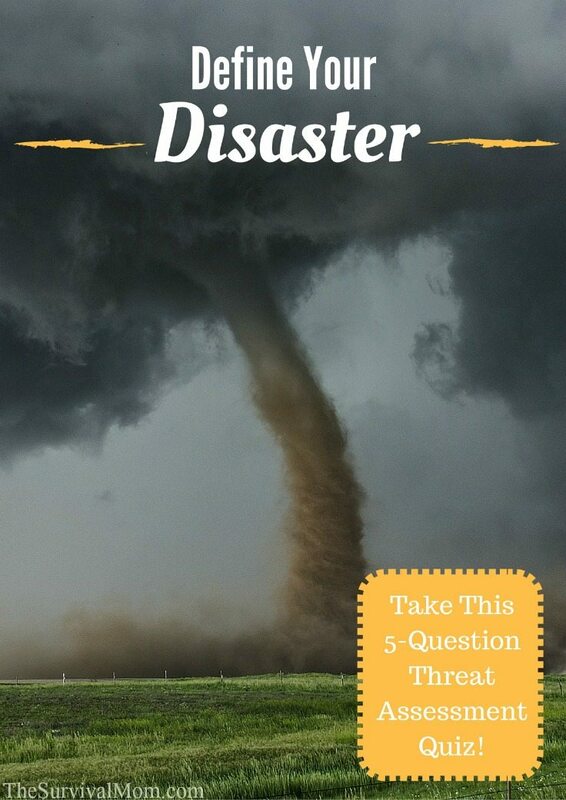 This will walk you through the steps of identifying which disasters are top priority for you and then narrow them down to which one you should prepare for first. By the way, this assessment is just one feature offered at Preppers University. 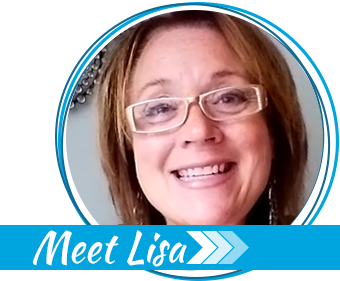 Click here to learn more and sign up for our next course! Why do you feel duty bound to provide for others? They have their chance just like all of us. Slothfulness will reap its reward. Family has been informed that if they want food, they had best do what I have done or be prepared to pay for it. I live on a river which rises often, though it has not broke into our property floods have been a problem in the U.K. this year. I am preparing to be a human being…to return to basics…to raise my children and teach my friends that there is no box. To teach that all life is sacred. To do what you must but harm none intentionally. Movement is life. Death is only a feeling you have for a split second there is no reason to fear it. Age is like leveling up. You only need five things…Shelter, water, food, friends and believe in something…what you believe will make all the difference. And lastly I prepare because I am the power that drives this meat puppet and I need to take care of it so I might learn. Recently I decided to start prepping. 2 weeks ago I got a generator and a water tote last week. I filled the tote yesterday and picked up gas for the generator a week ago. This morning at 3am the power went out, the septic full from a flooded yard and of course no water (on a well). I was excited because I was prepared and could offer my neighbors water. I wanted to say thanks. Many of the things I learned from you I have used today. Unfortunately the wildfires lately have reminded me our car is too small for the dogs, supplies and ammo. Anyone have thoughts on how to make an Aveo carry more? Or do we just need to look for a truck? Tough question because part of being prepared is planning for the everyday and Aveo is much easier on the gas budget than a truck and thus gives you more $$ to get out of debt or buy supplies etc. I love my electric car (see above re gas budget) but we have been dealing with snow snow snow and I miss my Subaru. I suggested to my husband that we find an older – good condition – rig for me to drive in this kind of weather, which comes around every year. Not too expensive but useful. I don’t want to drive his truck (I can barely get in the thing). So maybe you could find something like that. Another alternative is some kind of luggage carrier for the roof or a hitch and SMALL (we are talking Aveo here) trailer to haul extras. The absolutely best thing is you are doing is thinking and talking.